Captain Gilbert Pigé-Leschallas, Royal Dublin Fusiliers, born 1877, died at Gallipoli 1915. Gilbert lived in Frensham and is commemorated by a wall plaque in the church of St Mary the Virgin, on the left inside the door. He was the second son of Henry Pigé, a Tottenham businessman of Huguenot origins, who had lengthened his surname on becoming the beneficiary of a cousin, John Leschallas. 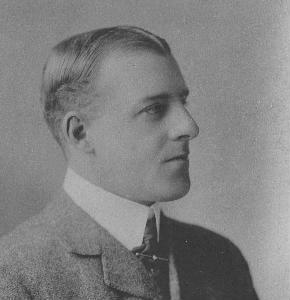 Gilbert’s newly wealthy father sent him to Marlborough College and Trinity College, Cambridge. 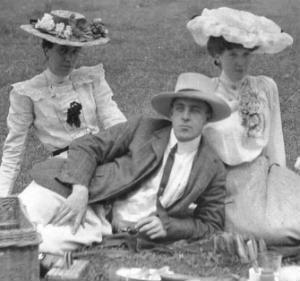 In 1905, at the age of 28, he married Edith Maud Bennett (seen on the right of Gilbert at a picnic, right) at St Mary Abbott’s Church, Kensington. They lived initially in Chobham where his two children were born, then moved to Frensham. The census record of 1911 shows him living in style at Broomfields in Frensham, with son Jack aged five, daughter Daphne aged two and a staff of five. The house (left, today) has retained its name. His career was in the Army and he was a Captain in the 7th Battalion of the Dublin Royal Fusiliers which sailed from Devonport for Gallipoli in July 1915. 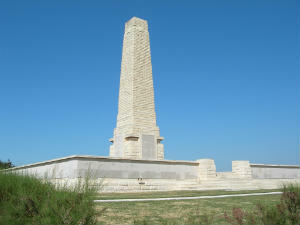 The battalion landed at Suvla Bay on 7th August and encountered fierce resistance from the Turks. Gilbert was killed on 15th August 1915, a week after the landing, aged 37. His name is on the Helles memorial at Gallipoli (right). Widowed at 33, Edith subsequently moved with her children, aged nine and six, to Merlewood, Lower Bourne. Later, she was married again, to a Farnham lawyer named Frederick Potter. When she died in 1955 a plaque was added to the wall beneath that of her first husband. Neither of Gilbert and Edith’s children married. Their son Jack became a schoolmaster in Dorset. Biographical note by Richard Wingfield, a great-nephew of Gilbert. 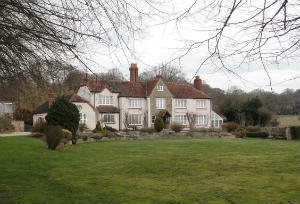 Chiltern House, Hardwick Road, Whitchurch-on-Thames, RG8 7HW.